It’s 2am I am sitting at a little over 5000 feet dangling my legs into the darkness below, watching a lunar eclipse in Joshua tree National Park. The rock releases the heat from daytime exposure to the sun, it’s warm to the touch. It’s taken me a lot of energy and time to get here, but it started with dreaming of surfing. “There’s been a schedule change check your email”, the principals voice cuts through a moment of calm before students arrive and before I start a day of teaching. Well, if I have to get on the computer I’m going to check the surf! So I do, it’s flat. One of the ads on the site catches my eye, it’s for a wilderness and outdoor education company. I click on it. I had already decided I was going to leave teaching in it’s most traditional definition. The question was really how to continue teaching and do my best work without the restrictions set by office dwellers that never step foot in a classroom or interact on deep levels with students. While working in schools I had started programs to meet the needs of a diverse population (in every way you can imagine) of students. These programs created smaller classes for teachers to teach and for students to learn. The classes were created for the specific needs of specific students. These were not lessons or programs copied out of a book or cut and pasted from the internet. These were programs for the students that would be right in front of the teacher. They worked, suspension rates dropped student achievement went up, teachers and students were happier. Then came budget cuts, programs started to get cut and mine was one of them. “We don’t have a title for these programs in the budget codes, how can we justify them?” was a comment I heard. How do we justify them?! Talk to the teachers, students and school communities that are benefiting from them. Justifying sounds like making up something, just look to the truth of what’s going on. It works. So, I checked the surf report and I found an advertisement for The National Center for Outdoor Adventure Education. That simple surf check has helped me travel the world as an educator. Get bored, go surf change your life, yes it was that simple for me. What was the first thing that you saw this morning, heard, tasted or smelled? How do these seemingly tiny moment shape our days and add up to a life experience? It’s five a.m my students are all still asleep in their tents, I sit on the trail in the village of Pothana looking towards the horizon. A local villager named Chimay is blowing incense my direction, to bring me luck, he says. What looks to me like clouds at first starts to organize and reveal what it truly is, snow fields and rock. Time to Retrain My Brain and the Way I See the Sky. I follow the snow fields up, up through the clouds, to what seems like an absurd height, finally the summit shows itself. Machapuchare, “the Fish Tail” as it is known in English, is a sacred mountain honoring Shiva. The mountain is off limits to climbers and only one attempt was ever made to climb it. The climbers stopped a few hundred feet from the summit, not because they couldn’t go on, they stopped out of respect for culture and peoples beliefs. The view of Machapuchare is how I kick off my first day on the trail in Nepal. A holy mountain that is pristine, respected and turns back explorers out of respect and sensitivity, not fear. 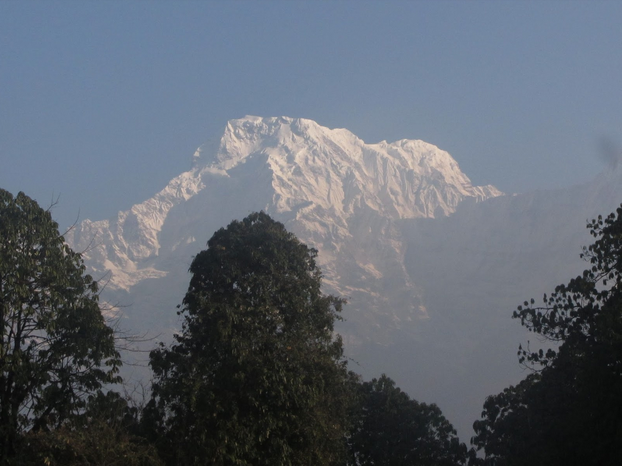 The information about the mountain was given to me by a local woman, guide, named Sita. She saw I was drawing a picture of the mountain in my journal and shared it’s history with me. I am in Nepal, teaching students to be leaders, problem solvers, and self sufficient explorers. We have come to Nepal for the beauty and the culture. We are here to remind the students that within each of them is a leader, thinker, explorer, world changer. The students are carrying everything they need. They have packed deliberately to ensure accessibility, balance and that the gear is compressed and comfortable (ABC’s of packing) .The weight feels daunting the first day but as the body and mind adjust to the task and pace of trail life the burden lightens each day. As I write in my journal I smell milk tea being brewed, and my mind relaxes. My bag is packed I am always up ready before the students. If they need help I can guide them and remind them that they have the knowledge and skill to break camp and lead another day. As of now most Nepales trekking companies help tourists carry their gear up into the mountains. I should clarify this, the porters carry unheard of weights on their back while tourists wear light daypacks or carry nothing at all. There is an industry surrounding trekking, it is a job opportunity, provides a service and allows access to many, that could not carry even the lightest of packs, into a beautiful mountain landscape. Three sisters Trekking company sent out two guides with my group so that they could observe our teaching techniques, outdoor skills, sight management skills and other aspects they want to bring to trekking in Nepal..
We are show stoppers, guides, porters and trekkers alike stop and watch as we carry all our gear on our backs. On an island the “coconut telegraph” is the term used to describe how information can travel by word rather than cell phones, news or other modern day gadgets. We got to experience just how fast word traveled along the trail. The clouds have parted and the summits let us get a peek and their beauty briefly, again. My students were sitting doing quite reflection in their journals when a Nepalese guide pulled me aside. “Are you leading the group of students who are learning to be leaders”? He went on to tell me he had never seen a group taking classes while trekking along these trails or any other he had guided on in Nepal. He thought it was amazing, I thought the exact same thing. I have brought with me a pack of handmade journals that I have given out to people in Nepal. I have given a journal to both Sita and Kiran to scribble, write or draw in. By the trips completion both have given me back the journals with beautiful writing, reflections and drawings. I explain the journals are a gift, theirs to keep, but they insist I take them back. No it is I that is receiving a gift, a custom crafted artistic memory in words and pictures from the minds and hands of the people that shape this land, culture and beliefs. On the last two days the students are guiding the trip alone, I am well behind them and a guide is well ahead. We meet them nightly at camp, for our education groups and reflection time but they are on their own. They didn’t make the summit they had planned to but each of us has our own summit and it is the experiences, encounters, opportunities triumphs and obstacles that shape those summits and who we are. At the Kathmandu airport we say our goodbyes, I head back to the states, my students to Korea, Sita and Kiran home to sleep. I order a milk tea, close my eyes and see summits, relax my brain and remember the smell of incense and luck. We are all healthy, happy, renewed and ready to go “Search and Enjoy” everywhere and anywhere.